The law is commonly recognized through the icon of a balancing scale, symbolizing balanced justice for two sides of one issue. 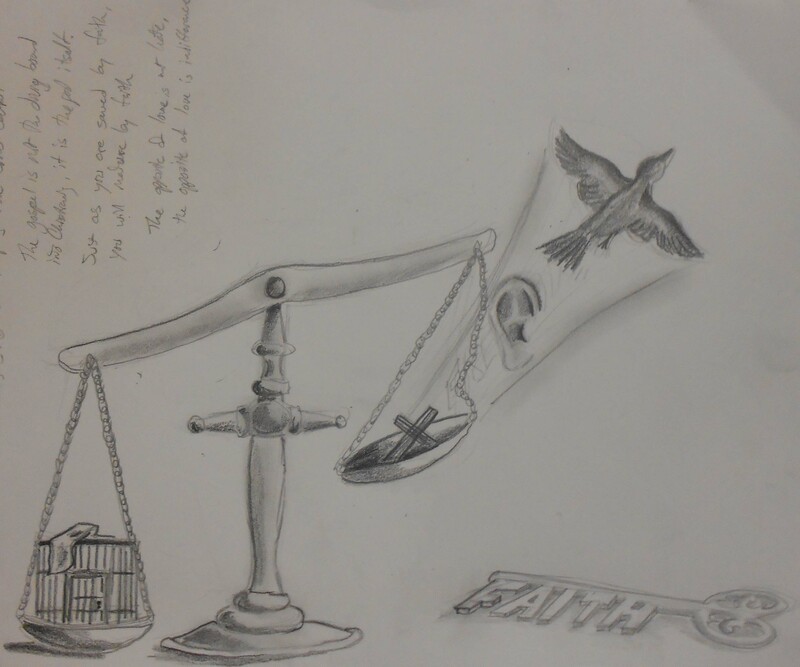 I have chosen to make the focal point of this week’s drawing a balancing scale to represent the church, particularly the one to which Paul wrote. The Galatian church was performing a balancing act with the gospel of Christ with the ancient law of Abraham; in this act the law was winning. This is not uncommon in the modern church. Stick with me here. I’ve not come across a church who enforced Abrahamic law combined with the gospel in my life time. What I have experienced is churches who present the gospel but then set an “understood” list of minimum guidelines a person must follow as well as having faith. Rules about church attendance, acceptable food and drink, volunteering, your place on social issues, and on, and on, and on. The list alone is exhausting, much more working to stay on the correct side of it all! Paul sees the church in Galatia doing this and his immediate response is; “FOOLS! !” I expect that would be a different word if Paul were in today’s culture (gullible idiots?). Alas, ‘fools’ and ‘bewitched’ is how the ESV translates his assertion. When the central focus of the church is not on Christ, his sacrifice, and faith through his gospel, our eyes turn from an extrinsic focus on impacting the world to an intrinsic focus on not becoming “like the world”. The gospel is not the diving board into Christianity, it is the pool itself. Just as we’re saved by faith in Christ, we also mature through that same faith. Getting back to the drawing, the focal point is a balancing scale. The center pedestal mimics the shape of a cross, alluding to keeping the message of the cross central. On the left side of the scale is a locked cage, a small jail cell. This represents working to hold to the law, imprisoning ourselves by self-imposed regulations. The Bible is pretty clear how impossible keeping His original law is (Romans 3:23), much less everything else we’d add. This side weighs down the scale, just like this kind of theological philosophy weighs down the church. There is a rag on the top of the cell. This rag is the blindfold, removed from the eyes of justice. The most effective way of gauging how well we’re keeping the rules ourselves is through comparison, self-righteousness requires seeing and dissecting our fellow church member’s actions (or lack thereof). The right side bounces in the air from the force of the bird who just launched freely into the sky. Resting in the right plate is a small wooden cross, the gospel. In the wake of the bird’s flight path is an ear. The gospel-centered church is the bird, hearing and receiving releases it to then go apply the gospel elsewhere. The gospel is the updraft on which we can soar, but clearing the ground requires faith. The secret to freeing yourself from a try hard-do good-fail cycle of trying to live by a set of religious rules? Faith. Young Christians often struggle with the concept of faith because their understanding of “faith” is defined by being “good” (keeping the rules). Keeping the rules is not the key to faith, faith is the key to free yourself from trying to keep the rules. Before I sign off today, living by faith in the gospel and not by following the law does not prevent us or free Christians from responsibility of calling out and repenting from negative, destructive, anti-gospel behavior. The “Christian” stereotype is often defined by what we’re against, the “worldly” stereotype is usually tied to not being against anything. Neither are accurate representations, but shouldn’t scare us off from making our voices heard either way. As we’ve seen thus-far in Galatians, Paul didn’t hold back from calling out false doctrine, neither should we. People may play the ‘love’ card on us, saying “Jesus taught you to love people, calling my actions sin or my ideas wrong is not being loving toward me!” Contrary to popular belief, the opposite of love is not hate, the opposite of love is indifference. Apathy toward a human you see running head on into disaster, that is hate. Your words and you artwork are just great. I can look at your drawing and remember all of the key points of what I’ve read. I sure hope that this is effective with young people. It would have been for me as a teenager. Your contrast of “Christian” vs. “worldly” well actually that whole last paragraph put so much into perspective for me. Thanks!